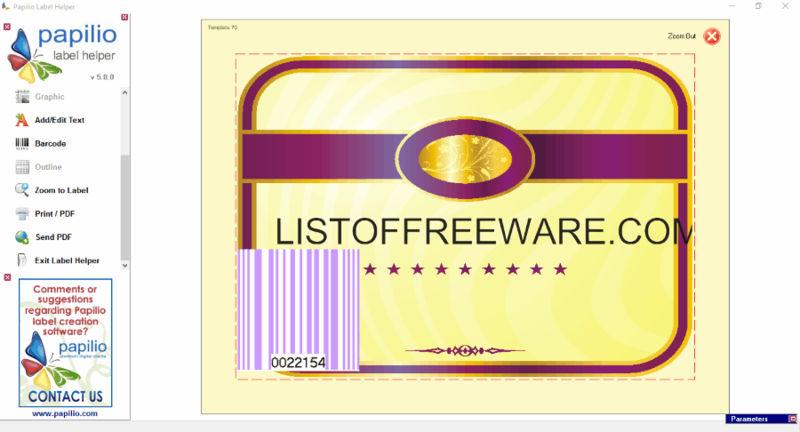 Here is a list of best free label printing software to create and print stunning labels for free. These free label printing software are quite simple and easy to use. You are provided with the option to add images, barcode, text, serial number, QR code, etc. as required. Options are provided to edit multiple labels at once, or either single label at a time. Different information, like: Printer information, label information, product numbers, etc. can be applied that makes it accessible as per the requirement. Different personalization options are also available. The best part about these software is that these are not printer specific and can be used for any printer. Out of these free label printer software, I like Papilio Label Helper the most. It is due to the fact that it is quite easy to use and can be used to print amazing labels for free. Using this you can choose the option to add text, images, barcode, serial number, etc. You re provided with a number of templates to choose from, and can easily choose to edit its different properties. You can either take a printout of the label, or choose the option to save it locally as PDF. Also check out the list of Best Free PDF Printers, Best Free DOCX Viewer, and Best Free Image Viewer. Papilio Label Helper is a good freeware that can be used to print labels for free. You can use it without registration for 30 days, and you have to register after that. Registration is free. In order to use Papilio Label Helper, you have to install DirectPlay. There are a wide range of colorful templates available to choose from. You can also design a label, and then choose to clone it and repeat the same pattern and thereby take a printout of multiple labels at once. Here you are provided a number of different objects that can be inserted into the label, like: graphic, text, barcode, outline, etc. Each of these tools have their own set of various options, like: position, alignment, size, barcode type, barcode data, barcode color, barcode angle, barcode position, etc. Various other settings can also be changed, like: page, position, alignment, clone label, turn current label on/off, select label background color to print, outline options, and work space color. Project can also be saved as sheet labels. Outline printing options can also be set, like print outline, outline color, line thickness, shadow color, shadow, etc. There are several other options to add/edit text, label control, graphic, barcode, outline, etc. Further options are provided to zoom to label, take a printout, save as PDF, etc. 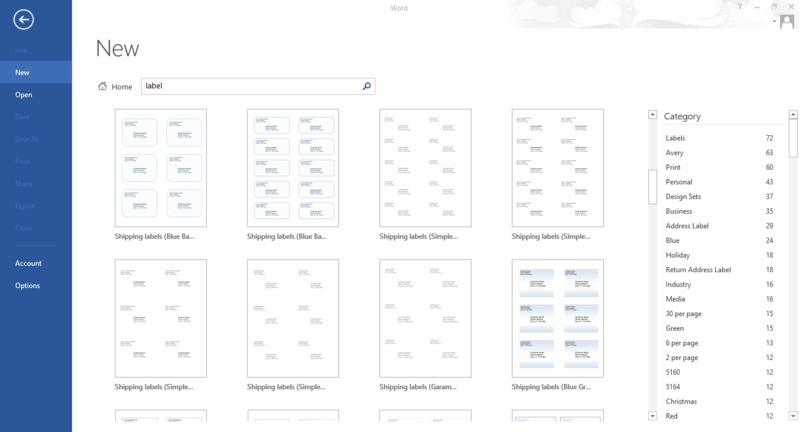 Choose to create a new project, and select a template from a list of templates available. Then create label as per your requirement by making use of several tools available. Change the properties of different elements making up the label. Choose to save project, take a printout of the project, or save labels as PDF. GIMP is a popular open source image editor freeware which can also be used to create labels and thereby be used as a label printing software. There are a number of image editing tools that can help you create beautiful labels as you require. You have to download a plugin GimpLabels or G’MIC in order to do so. It contains a number of other editing tools, where you can make use of text editing and inserting tool, image tool, selection tool, layer tool, color tool, filters, clone tool, blur tool, smudge tool, pen tool, healing tool, airbrush tool, etc. After you create the Label, option can be chosen to take a printout of label thus generated, or export the label as JPEG, PNG, ICO, TIFF, EPS, GIF, PDF, PPS, PSD, etc. Extract GimpLabels contents. Copy and paste labels.scm to scripts folder. On my PC, it is at C:\Program Files\GIMP 2\share\gimp\2.0\scripts. Open GIMP. Create a new file as per the dimensions required. You can also use the plugin feature to do so. 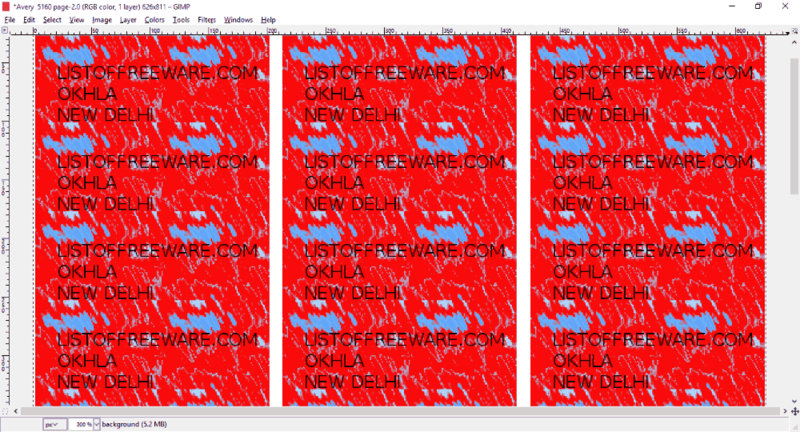 Browse to File>Misc>Labels>Rect label. Use built in tools to create the design that you like. Go to Filters&Combine>Make Label Page. Select option of template name, from, to, transparent background option, and printer fudge factor. Based on your selection, labels are created which can be either taken as a printout or saved into desired formats. If required, further edits can also be made. 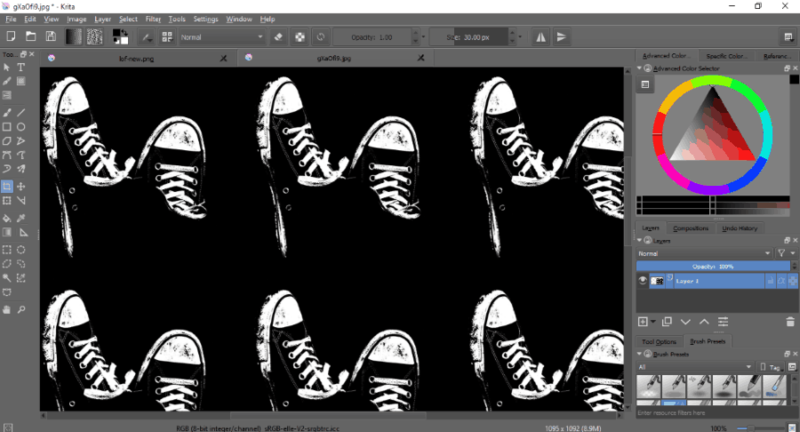 Open GIMP after installing G’MIC plugin. Expand Arrays & tiles and select Array [regular] option. Specify the number of X-tiles and Y-tiles. Set X-Offset or Y-Offset as required. Set mirroring options, and size options. A small preview of the output is also displayed. Finally click OK, and you are good to go. If required further editing can be done. Take a printout, or save it in required file format. Microsoft Office is a very popular software that is widely used to perform a number of tasks. In this you can also create and print labels using Microsoft Word and Microsoft Publisher. The best part is that you can find a number of labels templates, and use the ones that you like the most, and find suitable for you. Apart from the templates available already in online templates directory, you can also search for templates on other websites, or create your own templates. Information about different templates is also provided at the time of download. You can also choose different personalization option to make different changes to your label. There are various options to play around with so as to achieve desired results, like: insert various elements, design, page layout, references, mailings, review, view, design, and layout options. You can take a printout of your label, or choose to save it in numerous formats, like: DOCX, DOCM, DOC, DOTX, DOTM, DOT, PDF, XPS, MHT, MHTML, HTM, HTML, RTF, TXT, XML, ODT, and WPS. Open Microsoft Word or Microsoft Publisher. Browse to Mailings tab, and click on Labels. Enter the details and whether you want to use return address. Set Print Options which may be either full page of same label, or single label. Click on options tab, and choose different options that you want to be applied, like printer information, label information, product numbers, etc. If required you can also create your own label. Clicking on Print button prints out your label. In case you click on New Document a new document is created based on specified settings. Then you can make changes to the file using a number of inbuilt tools. Finally you can choose to take a printout or save it into desired format. Open Microsoft Word or Microsoft Publisher and browse for templates. Select the template that you like the most. Make edits to the template, and design your label the way you want it to be. After label is designed, change its printing options as per your printer, or choose to save it into the desired format. Inkscape is a popular vector graphics editor software that can be used as a label printing software. Here you can choose a number of inbuilt tools to create amazing labels. Here you can choose to insert amazing images, text, work with points, layers, path, object, filters, insert 2D and 3D objects, etc. There are several tools that can be used to work around with so as to make beautiful labels. After you create the label, it can be taken as a printout, or can be chosen to save it as SVG, SVGZ, PDF, PNG, PS, EPS, EMF, WMF, POV, FX, ODG, TEX, DXF, GPL, HPGL, HTML, ZIP, PLT, SK1, FXG, XAML, SIF, TAR, etc. Open Inkscape, and draw a label using built in tools as you deem fit. In case you want to create multiple labels at a time, go to Edit and choose Create Tiled Clones option under the Clone tab. In the new window that appears, use different tabs, like Symmetry, Shift, Scale, Rotation, Blur & Opacity, Color, and Trace to set the settings for tiled cloning. Specify rows, columns, width, height, shift, exponent, alternate, cumulate, exclude tile, exponent, base, rotation angle, blur, opacity, color, and trace option to set the output options. Clicking on Create button; it finally creates tiled clones of label created. You can further edit cloned objects individually as well. Take a printout of the labels or save it into desired format. 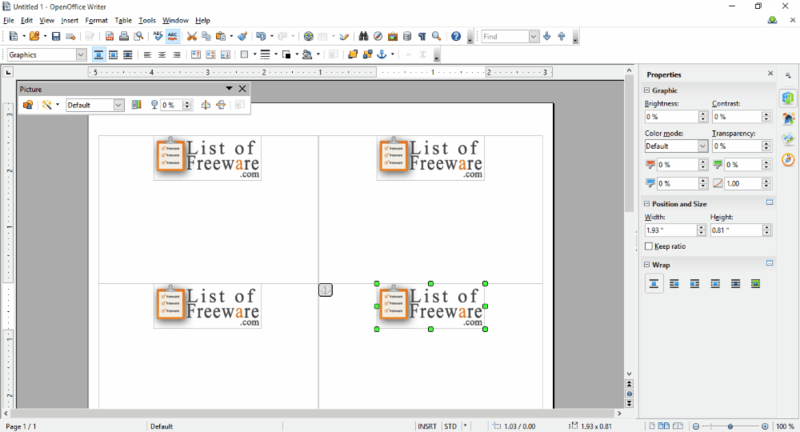 LibreOffice is a good open source office suite that can be used as a label printing software. There are a number of templates available online to choose from, so as to ease your task to make labels. Also different option can be chosen to add different formatting options, add text, tables, images, charts, tables, graphics, change text layout, etc. to make your label as per your requirement. You can also connect it to database and then create labels based on database entries. After Label is designed you can choose to either take a print out of the same or choose to save it as ODT, OTT, FODT, UOT, DOCX, XML, DOT, DOC, XML, HTML, RTF, TXT, DOCX, PDF, etc. Open LibreOffice. Choose a Label template that suits you best. Make changes to your Label using several built in tools, like: text, formatting, insert images, clipart, etc. Take a printout of the label thus designed, or save it into your required format. Open LibreOffice. Go to New and then choose the option to create Labels. Add label text address, database, table, database field, brand, type, format, etc. Make use of several other tools to insert image, text, clipart, etc. to personalize your label. Then document is created, and you can choose to take a printout of the file or save it in your desired format. Krita is another popular label printer software that is quite simple and easy to use. It already contains the plugin G’MIC which needs to be installed separately in GIMP. It provides option to easily create labels in GIMP. Here you are provided with a number of options to work around so as to create stunning labels. Here you are allowed to work around with layers, and apply several filters. The labels created can be printed or saved as KRA, ORA, CSV, EXR, GBR, VBR, GIH, JPEG, KPP, ICO, EXR, PBM, PGM, PNG, PPM, PSD, QML, R16, R8, SCML, ICB, TGA, TPIC, VDA, VST, TIFF, BMP, XBM, XPM, WEBP, etc. Open the label that you want to be printed, or create your own label using several built in tools available. Then click on Filter tab and then select G’MIC. In the new window that appears, select Arrays and tiles option. Choose Array [regular] option and specify the X-tiles, Y-tiles, X-offset, Y-offset, Mirror, and Size options. On clicking the OK button Label is created as required, and you can make further edits to it, take a printout, or save it into desired format. 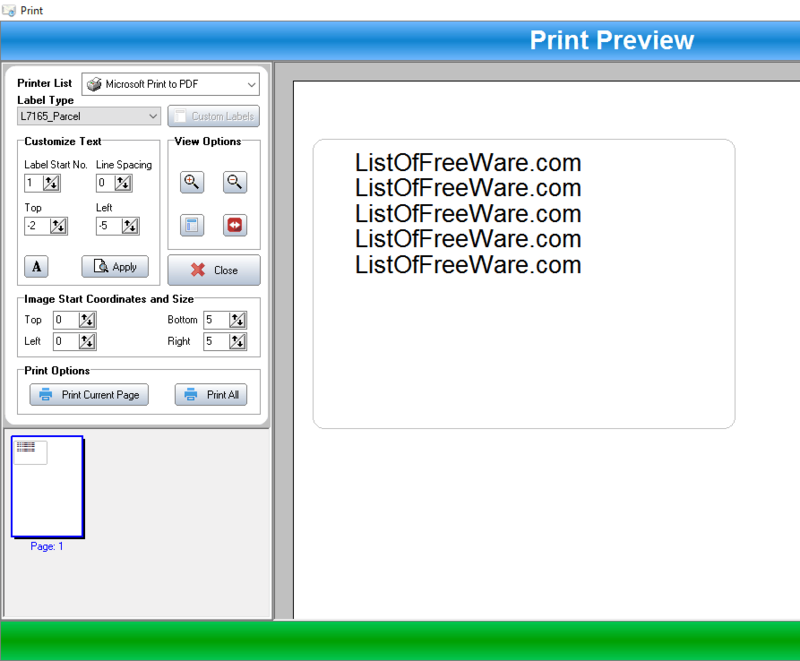 SSuite Label Printer is a good freeware that can be used to print labels. In the package you are provided with a number of other software, like: Address Book, Envelop Printer, Mail Merge Master, and QT Writer Express. SSuite Label Printer is quite simple and easy to use. You are provided with two options of Address Printing, or General Printing as per the requirement. The best part of this freeware is that you can also choose the option to import data from CSV files. If required data can also be exported as CSV. The entries can be added, edited, or deleted as per the requirement. A number of label type options are available to choose from. Here you can also choose to apply custom labels. Extract SSuite Label Printer to a location. Add details of label to be printed. Option can also be chosen to import or export data from CSV. Select contacts for which the label is to be printed. Click on Preview and choose different options, like: printer, label type, customize text, change font, font size, font type, image start coordinates and size, etc. 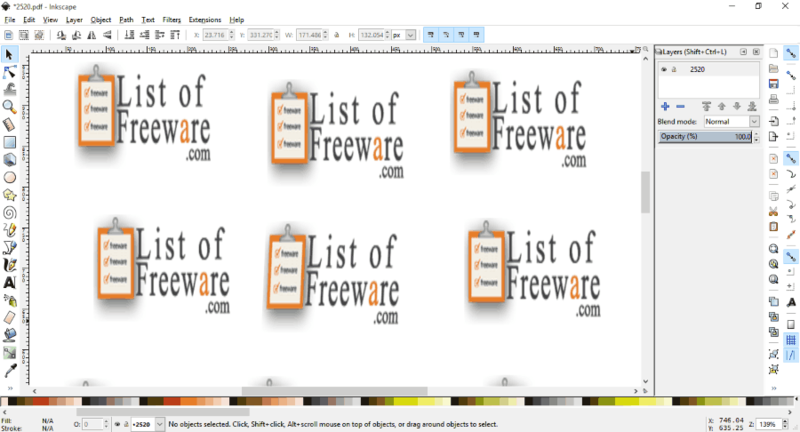 Avery Design&Print is a simple freeware that can be used as a label printing software. There are a number of features that help you to easily design beautiful label. 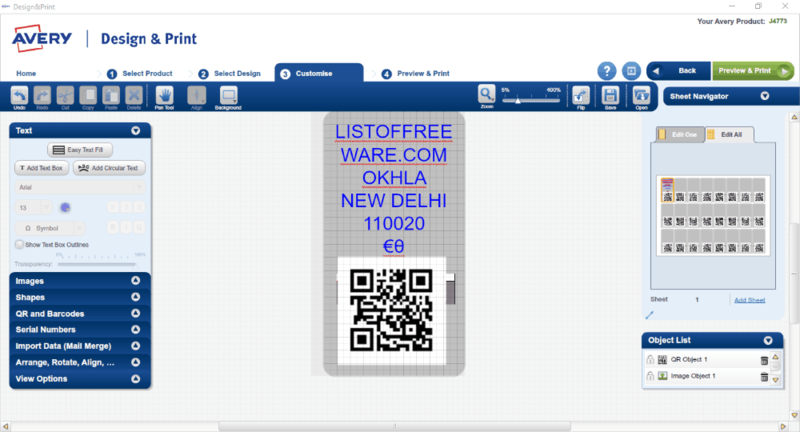 Here you can choose to insert text, images, barcode, QR, serial numbers, etc. It can also be used to import data and make labels from the same. The best part of this freeware is that you can choose the option to make labels using either same values or different values quite easily. Register and login to the software. Choose to start a new project by typing a product number, or selecting a category from a number of available option. Select a product. Select a design as you deem fit. Customize your label using several tools available. Insert text, images, barcode, shape, QR, serial numbers, etc. If required data can also be imported. Option can be chosen to edit a single label or all the labels at once. Label design can be saved as AVERY on either PC, or online on your account. You can also choose the option to take a printout of your label. IDAutomation Free Barcode Label Design is a good software that can be used as label printer software. The best part in this software is that, you can choose the option to add text, barcode, ellipse, rectangle, line, image, etc. This barcode label software can also be used to create labels by importing data from database. Different alignment options are available to be move elements forward or backward. Elements can be spaced horizontally, or vertically, and rotated right or left. Open IDAutomation Free Barcode Label Design. Choose the option to create a new label. Here you have to make printer selection, label stock type, and preferred units. Then make label stock selection form a number of options, or choose to make your own label, where you have to enter the dimensions, and the number of rows or columns. In the layout generated, design your label, using several tools, like: text, barcode, image, lines, ellipse, spacing option, rotation option, alignment option, etc. Finally option can be chosen to take a printout of the labels thus generated, or save it as IDA. Paper Label Maker is a good label printing software. Using this you can choose to create either single label or multiple labels. It is quite simple and easy to use. Options are provided to set place, z-order, trace, or other common options. Also provided are the option to set font, and alignment option. You can also select to insert images from a number of images available, and can also upload your own bitmap files. Lastly you can choose to view a preview, or take a printout of the same. Create a new project and specify a name for it. Then change place, z order, trace, and border options as per the requirement. Also font, font color, borders, etc. can be applied. Insert images that suits best. Choose the option to view preview or take a printout of label. If desired, label can be saved as PMS. 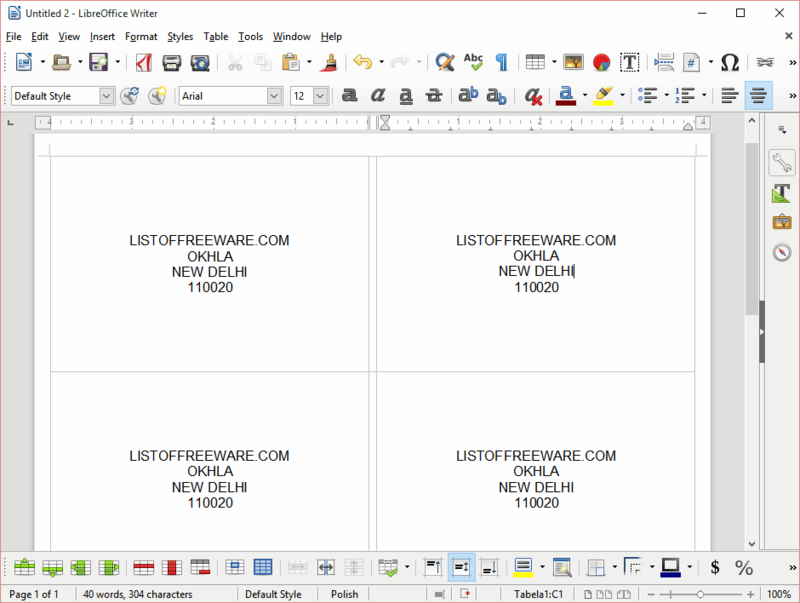 OpenOffice is a popular freeware Office Suite that can be used as a label printer software. There are a number of amazing templates available that can be put to use while designing labels. These templates make the task of printing labels quite easier. There are a number of other tools that can be used while designing your labels. You can play around with them in order to make quite stunning labels as required. You can make use of the option to insert tables, images, fontwork, text options, graphics, etc. Finally option can be chosen to either take a printout of the labels available or to save labels as ODT, OTT, SXW, STW, DOC, RTF, TXT, HTML, XML, PDF, or UOT.